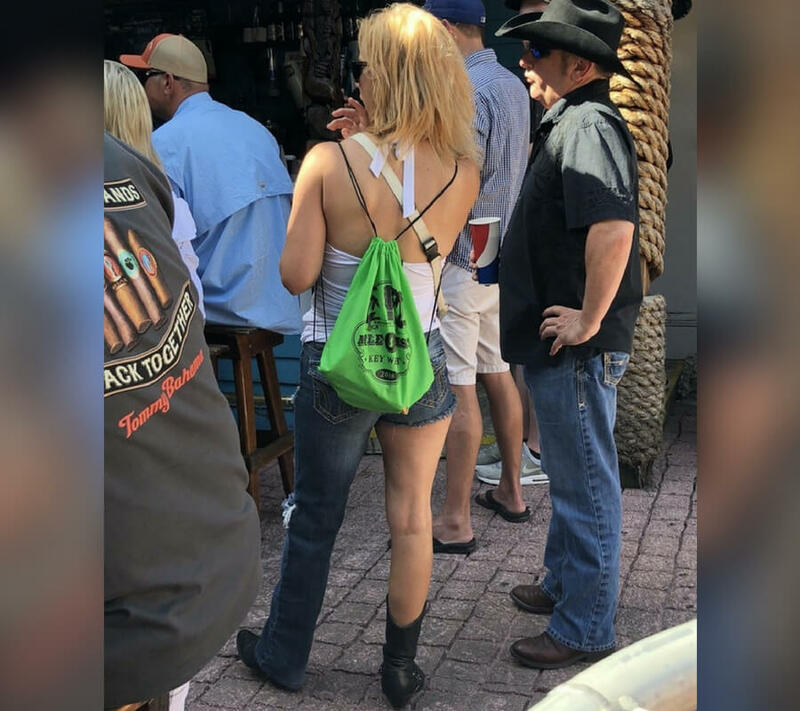 Let’s get one thing straight — we’ve all had our “trashy” moments at one time or another. Whether it’s getting into a fight because someone cut in front of you in line at Starbucks, or having to pay for your $15 dinner in all quarters and dimes and making the server count it all — we’ve been there, and it’s somewhat relatable. Thankfully for most of us, these moments of being pure trash are just that, moments. The desire to publically show the worst side of yourself doesn’t follow you around as it does with some people. Have you ever seen the pants version of a mullet? Prepare for the need to plug your nose as you sift your way through this pile of human filth. 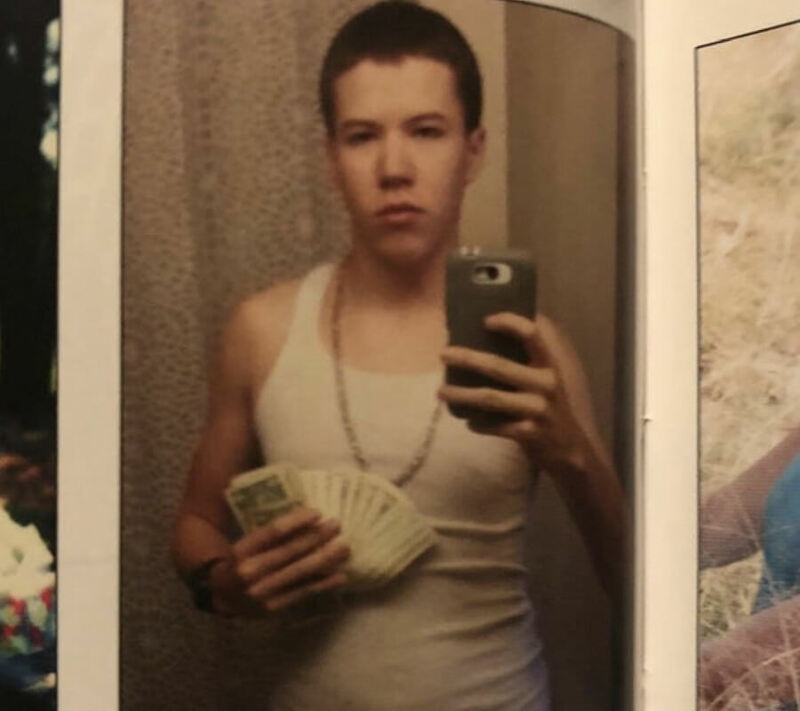 I’m just going to go ahead and assume that anyone who poses with money for a picture actually doesn’t have any money. Has anyone ever said, “shopping with kids is way more fun than shopping alone?” The answer is probably not shocking, but that has never come out of anyone’s mouth. 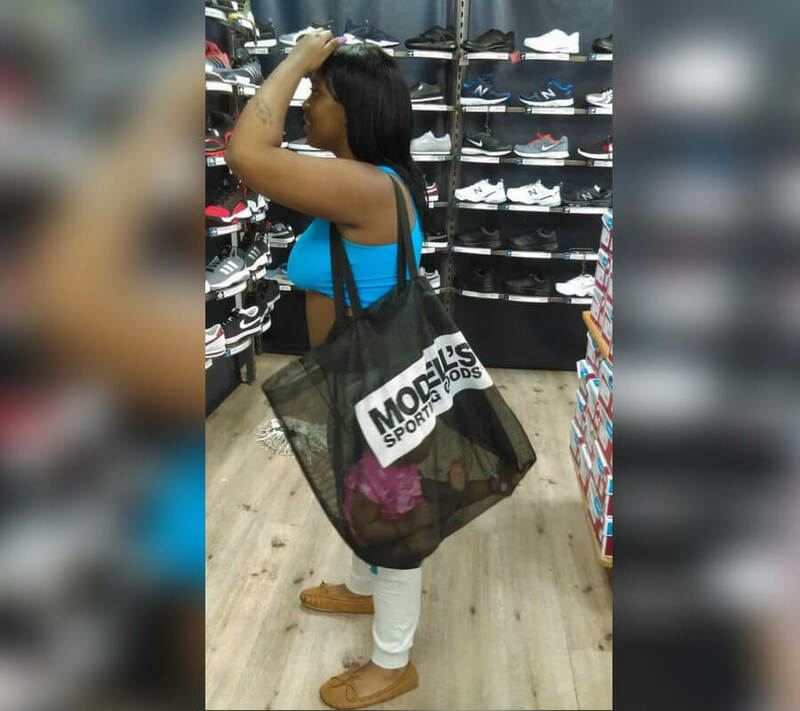 There are a few options that this mom could’ve explored before she decided to shove her kid in a shopping bag like a T-shirt from the sale rack. Coming up, the pants version of a mullet. It’s captivating, yet confusing. Can we just talk about how infinitely good pogos are? Has anyone ever had a mediocre pogo or are they always absolutely mind-blowingly good? 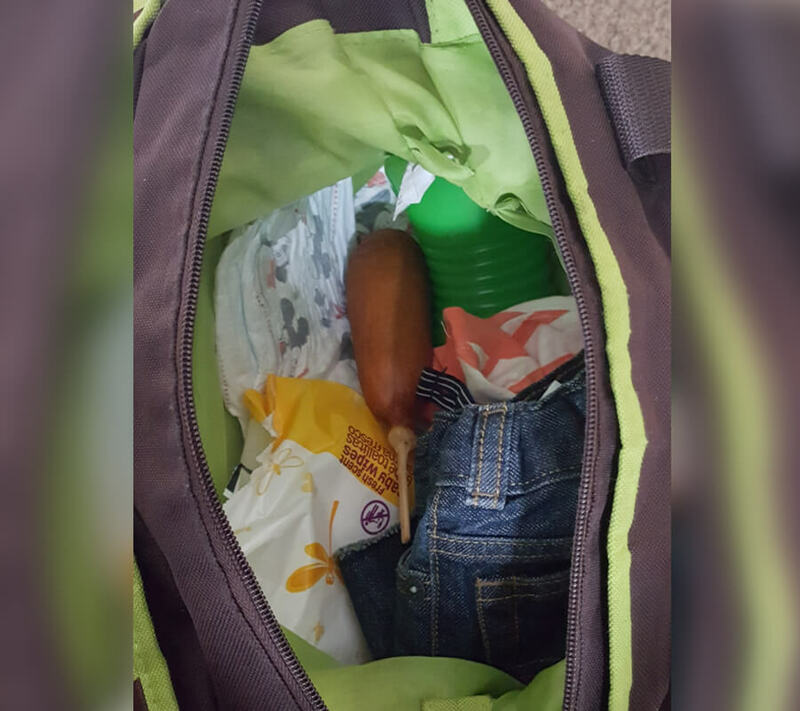 I don’t blame this person for having a pogo in their bag, but I do blame them for the presentation and safety of it. WHY is it not secured in, at least, a plastic bag? This is hard to look at. When you grew up in a small town, you can relate to this picture. People from big cities just don’t understand the things that we did for entertainment. You haven’t seen creativity until you’ve witnessed a group of small-town 11-year-olds scouring a backyard looking for ways to keep themselves occupied. 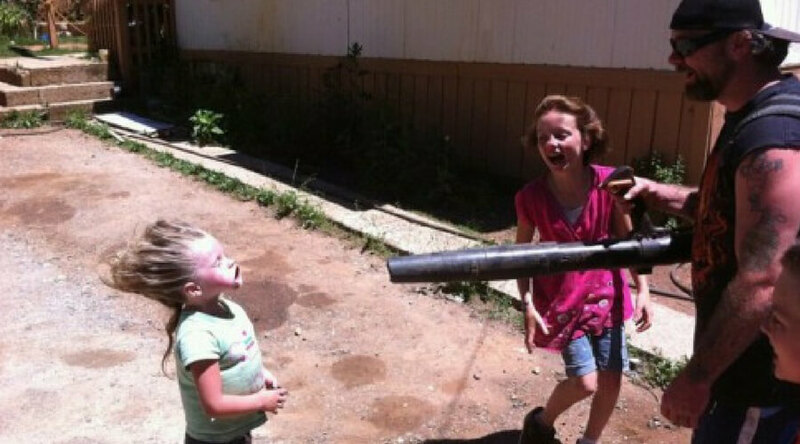 Finding odd ways to use a leaf blower is one of the classics. You know those days when it’s too hot to wear pants, but it’s too cold to wear shorts? Well, you’re welcome. This is the best solution to that issue. If these pants were a hairstyle, they’d be a mullet. Let’s just hope that when she bought them they were already half-off. Get it? Half off the price. Right? Okay, I’m done. 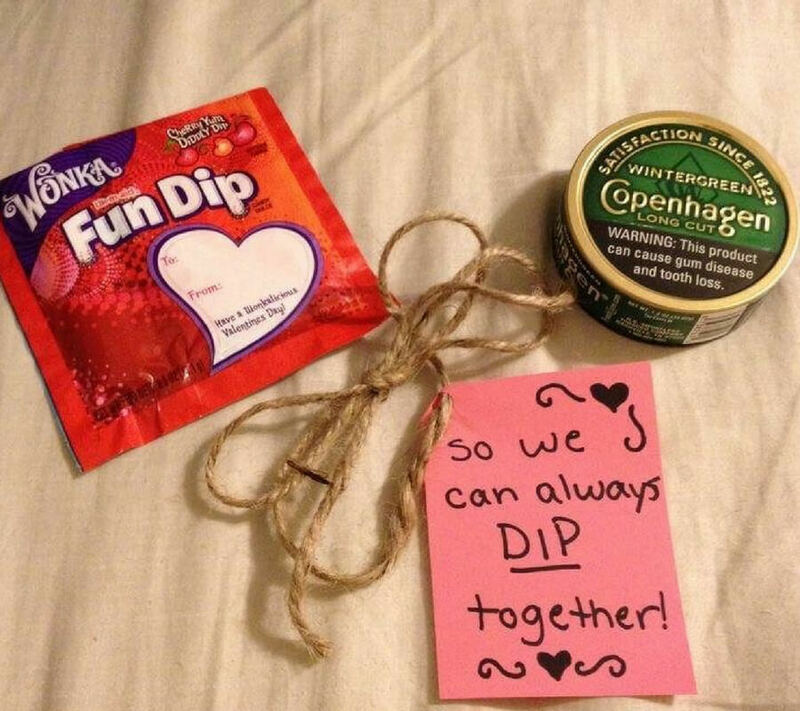 This couple’s Valentines Day took a serious DIP in a pool of tobacco and it’s very redneck. When it’s finals week at school and your stress and anxiety levels are at an all-time high, this outfit is necessary. I was always told to dress for how you feel, and if you feel like trash the least you can do is look like it too. 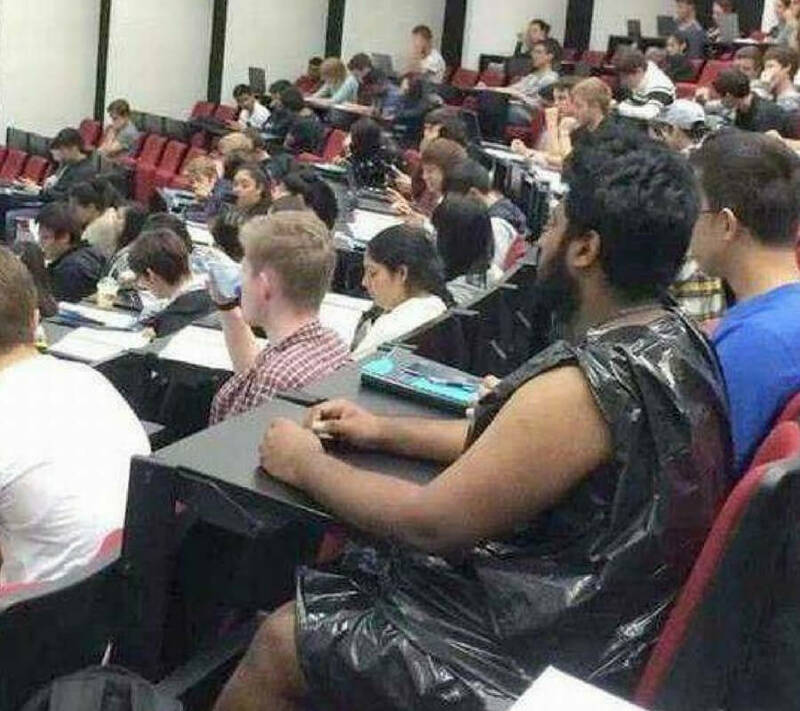 What’s even more beneficial is that garbage bags usually come with their own scent too, which means you don’t have to worry about cologne. As a parent, you usually want your kid to take all of your good qualities and use them while ignoring the bad ones. 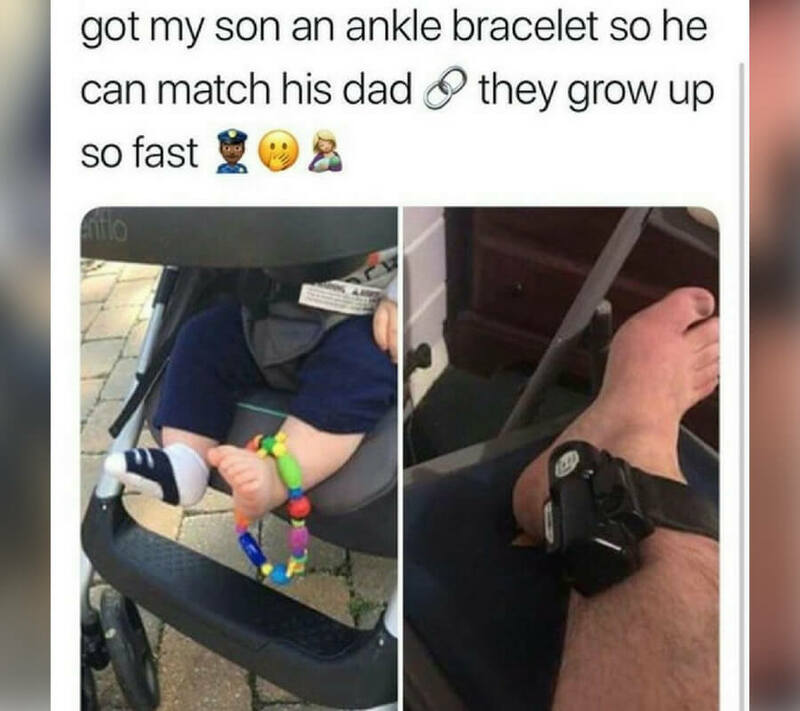 I’m not a doctor, but I don’t think that having to be on house arrest falls into the “good qualities” category. It’s interesting to note that chewing tobacco contains 30 chemicals that are known to cause cancer. It’s also interesting that Fun Dip contains colored sugar on sugar on sugar. In case you’re in the dark on this one, sugar is also known to cause cancer. So, these two dips are basically the same thing, right? 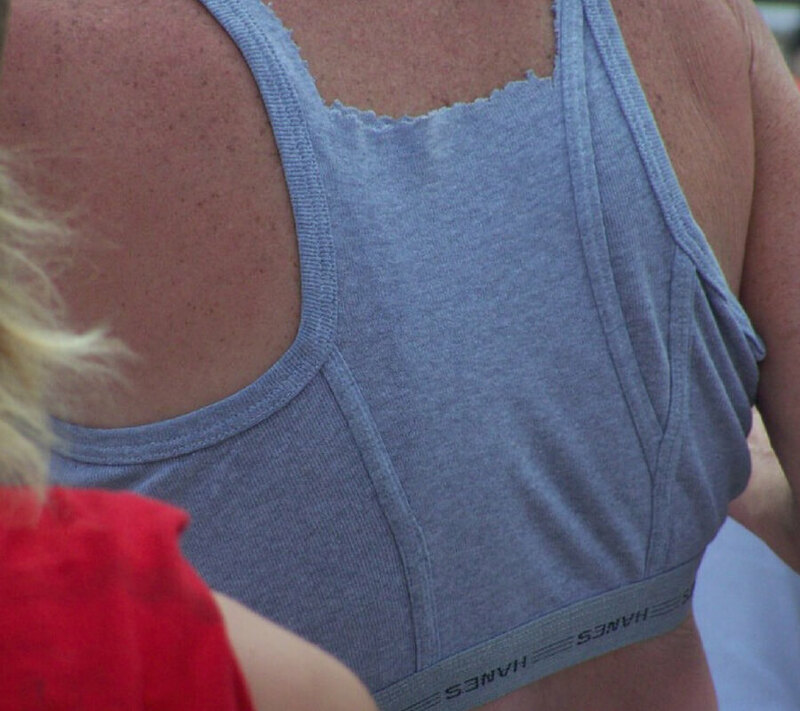 You may not agree with the clothing choice just ahead, but you’ll appreciate the willingness to recycle. 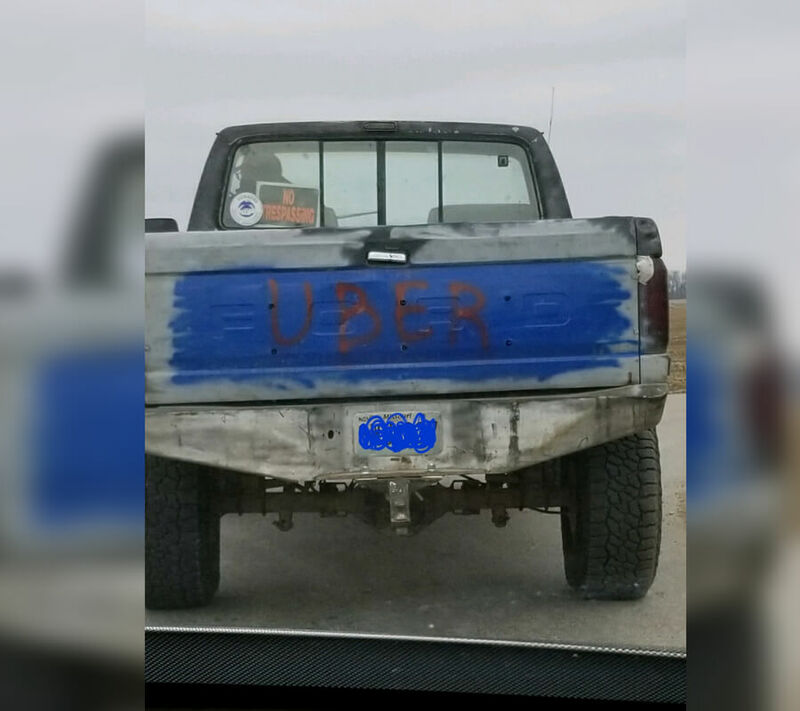 This Uber would be driven by a man named Darryl who has beard hairs that are longer than the hair on his head. He wouldn’t stop complaining about how many bad drivers are in your city and say “I’m not racist, but..” before every sentence that was 100% racist. In other words, if this Uber pulls up — run. This girl has saved more relationships than Dr. Phil and Oprah combined. She’s out here just hustling, and we can’t blame a girl for being independent. What’s wrong with penetrating a portion of the market that really hasn’t been touched. 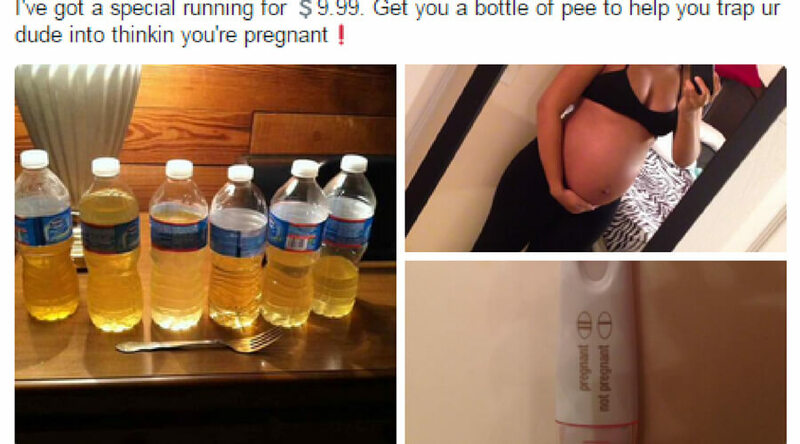 Fellas, whenever your relationship is starting to feel rocky, you need to be cautious of pee dealers. Just so everyone is aware, it takes 700 gallons of water just to make a cotton shirt. The average American throws out about 82 pounds of textile waste every single year. It can take clothing up to 40 years to decompose. So, now that you’re armed with this information, I sure hope we see more recycled shirts like this. 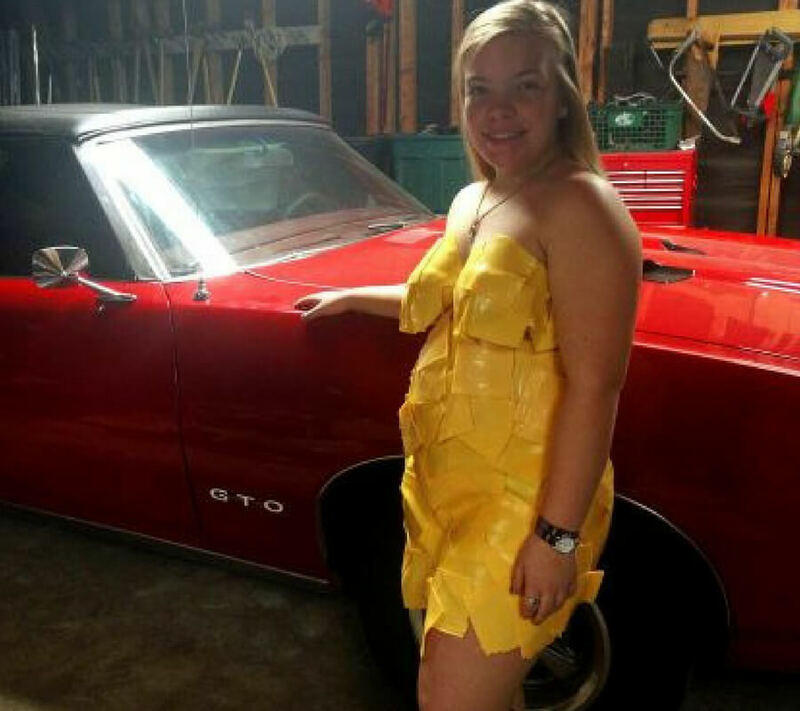 Ready to see the cheesiest prom outfit of all time? And by cheesiest, I literally mean cheesiest. So there’s being a super fan, and then there’s just being ridiculously obsessed/ borderline crazy. 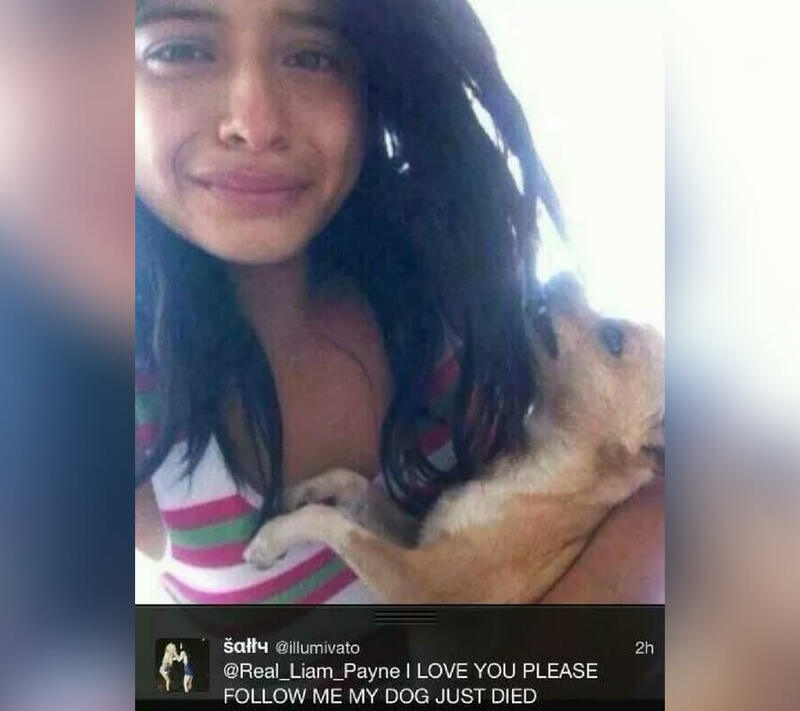 This girl wants a follow back from her favorite One Direction star so badly that she took a picture with her dead dog for brownie points / to guilt trip into a follow back. Even if we put this picture in isolation, can we just talk about how gross it is to hold your dead dog in general? Well, let me blow your mind by telling you that four calories are in a single Skittle. They also contain a decent percentage of your daily recommended Vitamin C intake. 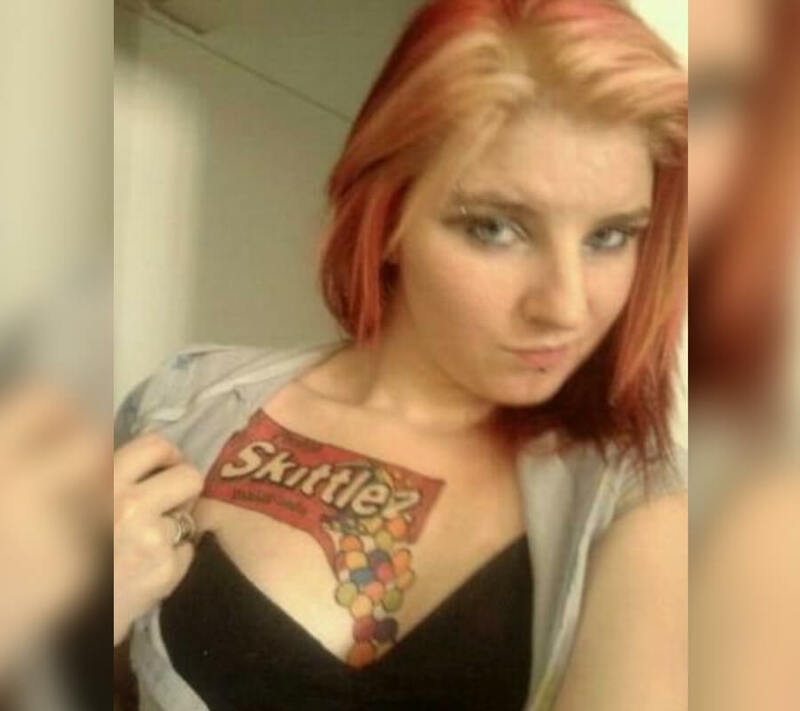 So, go for it, taste the rainbow. This is the cheesiest dress I’ve ever laid my eyes on. 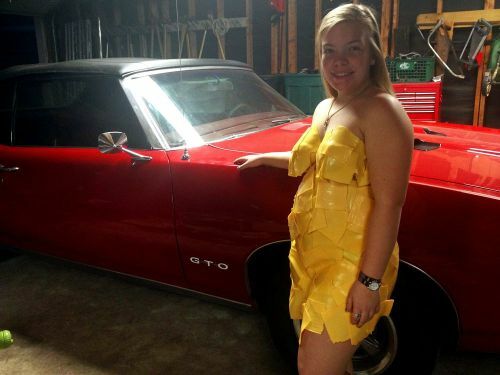 This dress is literally made out of sweaty Kraft singles. We could feed an entire country grilled cheese for a year with this cheese. No matter how hard she tries, standing by a classy car does not add any value to this dress whatsoever. 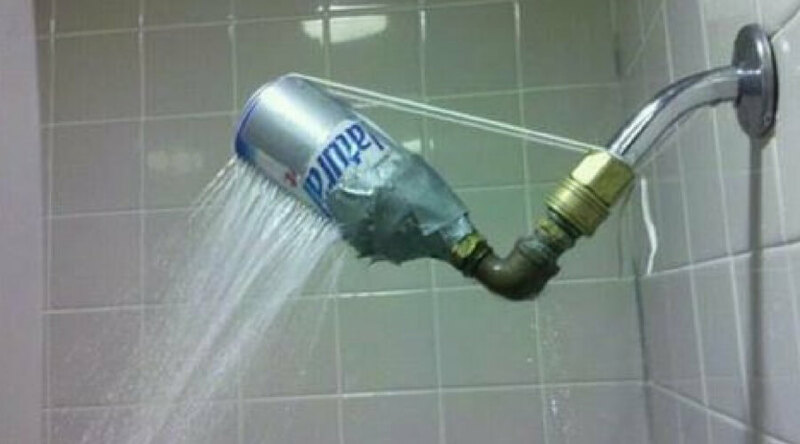 Trashy people can find a use for beer in EVERY situation and environment. Just ask this person coming up. 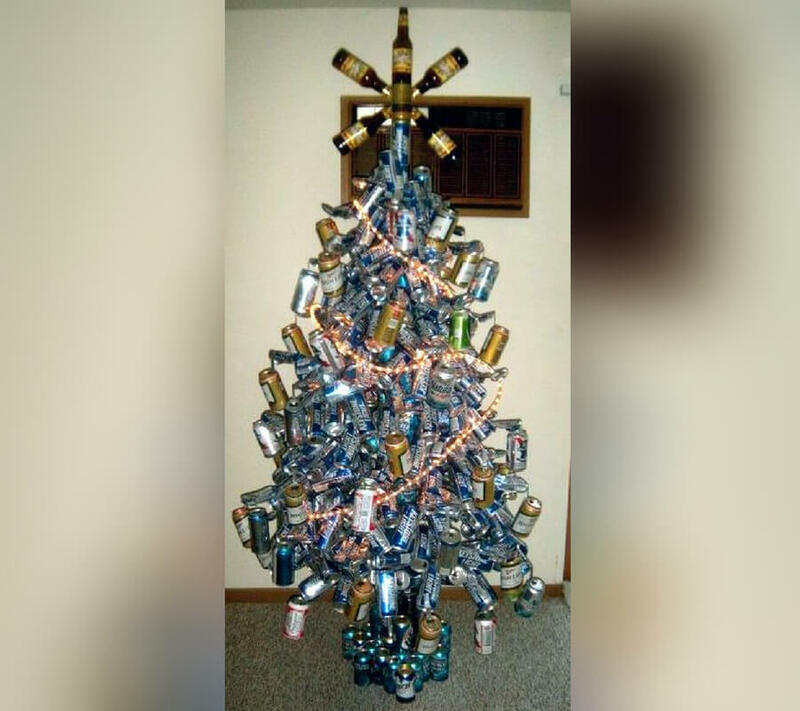 In parts of the South, the beer can tree is actually very common. They can be difficult to find out in nature, so many people just resort to growing it themselves throughout the year. Depending on your family, beer trees on average take about three months to grow but can take up to nine months. If you’re going to hunt, you should either eat them or use them as pencil cases and nothing in-between. This picture was obviously not taken in Kentucky where eating squirrel brains is considered a delicacy. 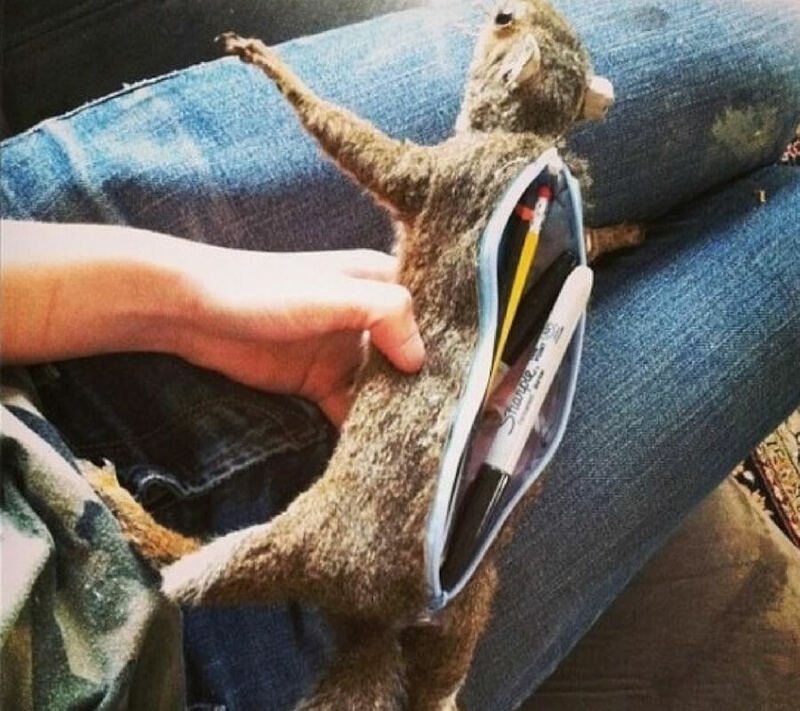 With that being said, squirrels have been known to carry Mad Cow disease which zombie-fies you by eating your brains, so it’s probably safer to just use it as a pencil case. Shower heads are very expensive — well, the good ones anyway. Why go out and buy one when you can just crush a Natty Light, poke some holes, and grab some duct tape. You can then go and tell your vegan, environmentally friendly peers that you take natural showers and they’ll be very impressed. 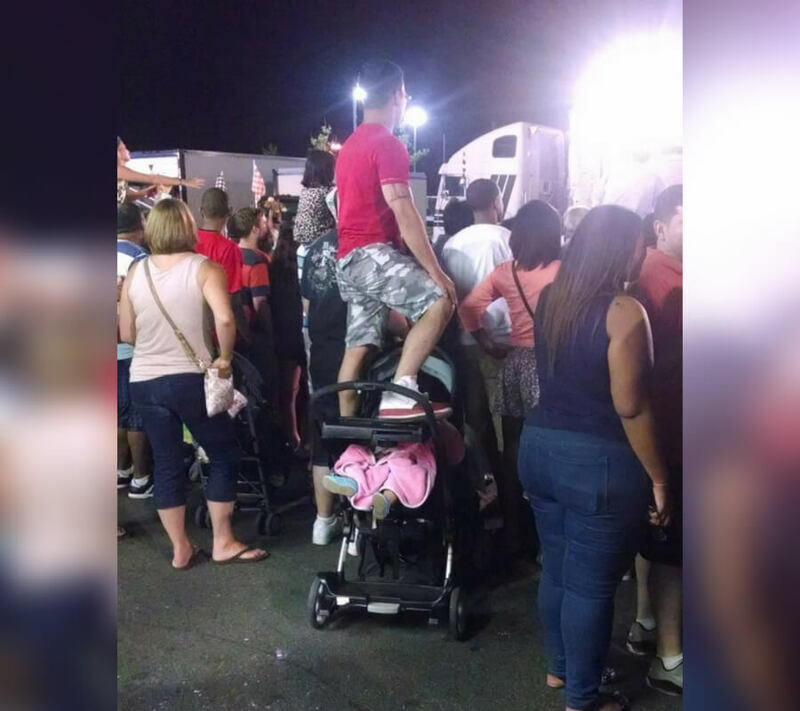 Being trashy does have some redeeming qualities to pass along to the next generation. First of all, trashy people have excellent resource management skills. 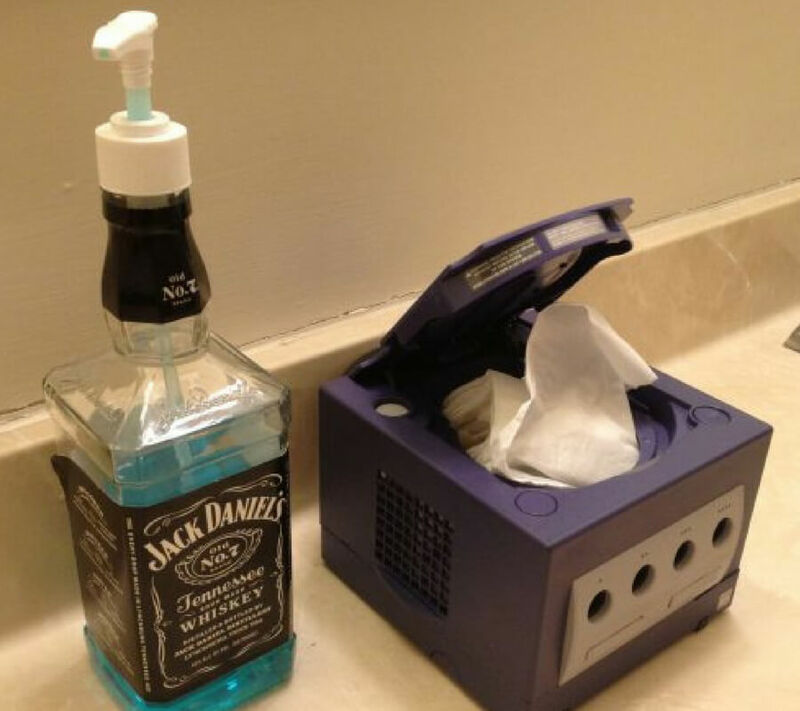 No one in the suburbs is going to see a GameCube as a potential kleenex dispenser. Similarly, no one in the suburbs will EVER use their empty JD bottle as an elegant soap dispenser. 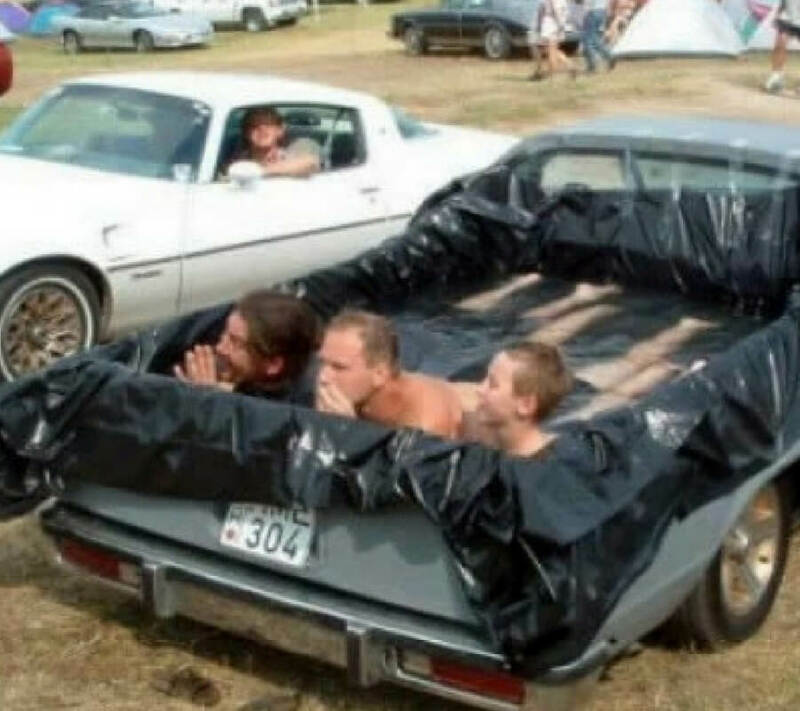 When it’s a hot day and you don’t have a pool, you make one. When you’re a red neck, the world revolves around your truck. It acts as your porch, your pool, your bed, your drink cooler, and in SOME cases your method of transportation.